Select one or two ribbon colors to match your scheme. 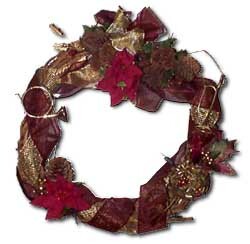 Starting at the "top" of the wreath, weave one length of ribbon in and out of a loosely wrapped grapevine base, or if the base is tightly wound, simply wrap the ribbon loosely around the outside. As you wrap, twist the ribbon and secure to the base with a spot of hot glue at varying spots. Secure the ends with a spot of hot glue. If using two pieces of ribbon, start the second ribbon slightly offset from the first, and wrap / twist in the opposite direction. Make your "main attraction". I like a large bow with decorations attached to its center. For instance, remove the center of a large bow, glue a small cluster of pine cones to the center of the bow, and then a few small bells hanging down the back of the bow. 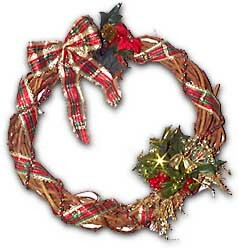 Now, you'll need to decide whether you want your wreath to look symmetrical or assymetrical, sparse or full. I prefer a slightly sparse, off-kilter look, so I usually place the most prominent decorations at 1 o'clock, with smaller decorations at 7 o'clock and/or 5 o'clock, and let the ribbon do the rest. For a more symmetrical look, place your main attraction at the twelve o'clock position on your wreath. Attach it with wire and hot glue so that it hides the ends of the wrapped ribbon. Whenever you use wire to attach a piece, twist the ends together with your needlenose pliers, and then bend the ends down so that you don't have sharp wire ends sticking out. Start attaching your smaller decorations at the 5 and 7 o'clock positions on your wreath. Place the largest decorations first, securing them with wire and/or hot glue. If you want a fuller look, keep attaching decorations until you're happy with your wreath. Often you can hang a grapevine wreath by hooking one of the top vines on a nail, but if necessary, loop a small piece of wire through a vine at the top and twist the ends together. Then hang your wreath by a nail in the center of your front door for all to enjoy!